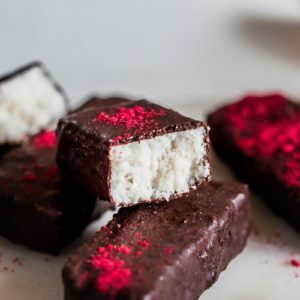 Lush and creamy raw bounty bars encased in a homemade raw chocolate – extremely satisfying treats! In the spirit of being a modern gal, this year I’m my own Valentine! And I’m enjoying this lovely batch of raw bounty bars all to myself! This is because, my love, has slacked off in the romance department. He’s ‘caught the fish’ and no longer sees reason to woo me. All I can say is, just as well he is an incredible human as I can happily forgive this small shortfall of his! 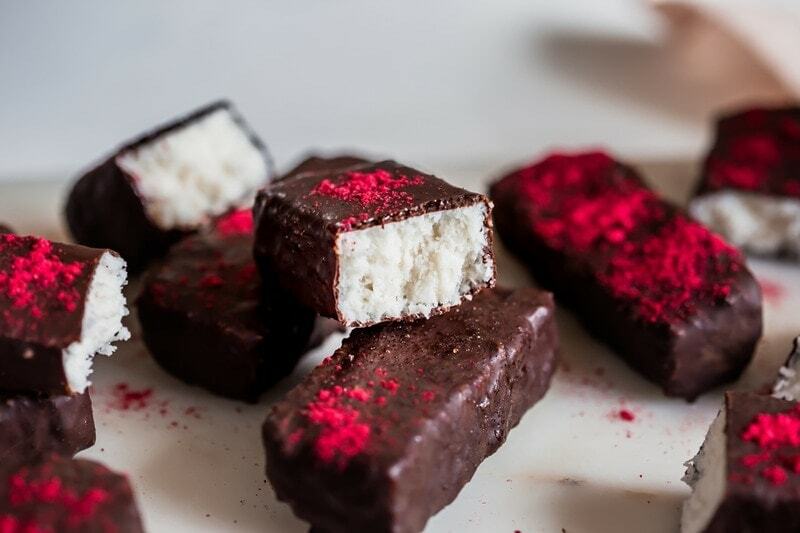 So, there are many raw bounty bar recipes on the interwebs. But this is my version, and I have made it as low sugar as humanly possible, which is always a good idea, but especially so at this time of year having had all that indulgence over summer. The bounty filling is a simple mixture of desiccated coconut, coconut cream, coconut oil, cacao butter, vanilla, sea salt, and xylitol. If you can, choose organic and unsweetened desiccated coconut, as much of what is on offer in supermarkets has been preserved with sulphites. This chemical is also found in wine, dried fruits, condiments, soup mixes, pastries… the list goes on. Some people have sensitivities to sulphites that range from mild to severe – have you ever had a glass of wine followed by a stuffy nose? This is an example of a mild reaction. Best to avoid, natural all the way. Coconut cream helps lend some sweetness, and softens the texture of the bounty. I used a can of organic coconut cream, and shook it up super well to combine the fatty solids with the liquid, then went from there. There is no need to refrigerate it and skim off the cream at the top, in fact, having tried that, it made for a VERY crumbly bounty bar. 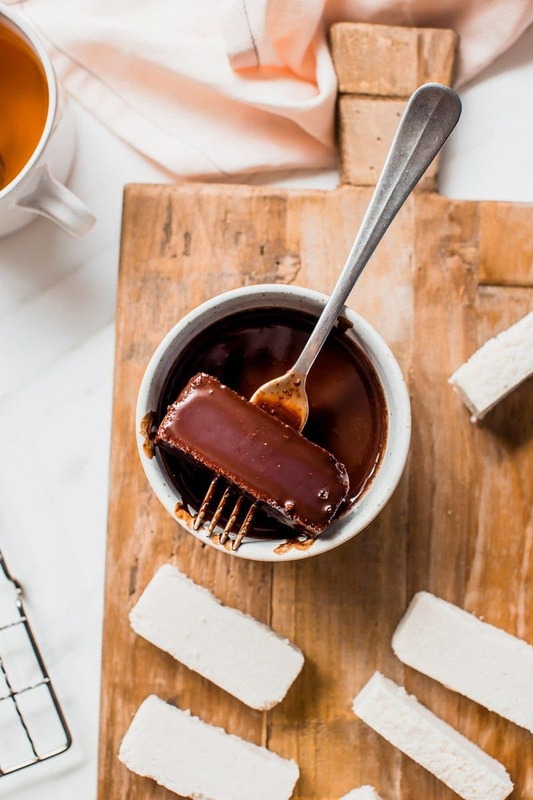 Cacao butter is something you won’t find in other bounty recipes – but I decided to add it in to help bind and solidify the mixture in lieu of a viscous sweetener such as maple or brown rice syrup. Speaking of sweeteners, I chose organic Birch-derived xylitol – a fine white powder that has a strong sweetness to it yet chemically is different to sugar and does not cause a rise in blood glucose. It often comes sold as crystals, in which case, you can powder them down yourself by blitzing for a minute or so in a high-powered blender. Be sure to check the source – I much prefer Birch over corn. 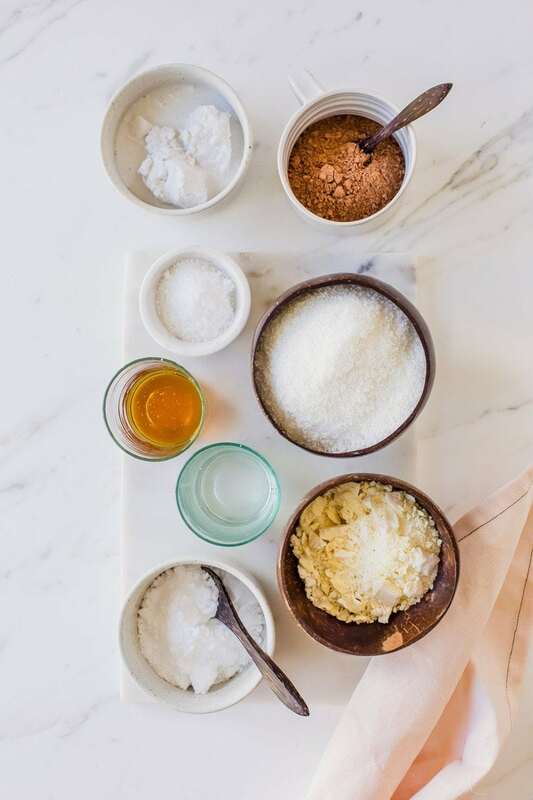 This is something I keep on hand in the pantry and often turn to when I want the sweetness without the corresponding blood sugar effects, or when I want a sweetener that is white and won’t colour my mixture. The above ingredients are combined in one bowl, mixed by hand, then pressed into a rectangular bread tin, ready to freezer and cut into perfect bounty-sized bites. 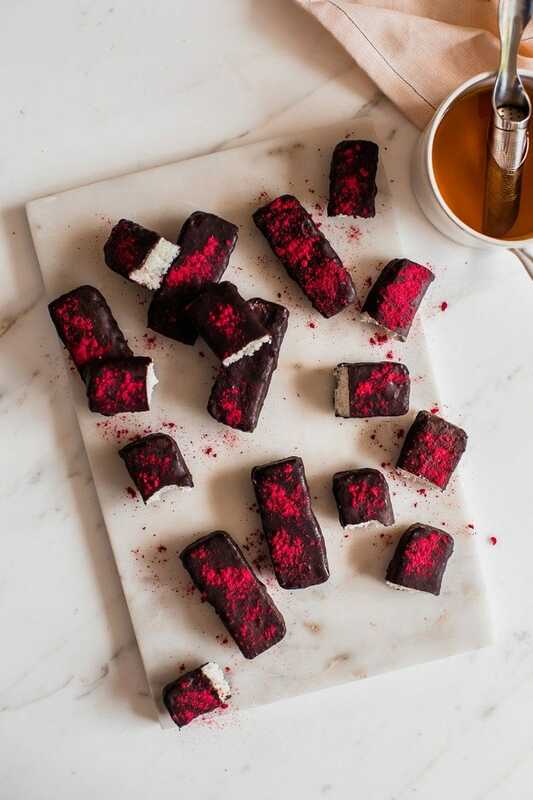 The raw chocolate coating is a half-batch of my classic recipe – the only change being I used brown rice syrup in place of the 50/50 blend of maple and coconut sugar. 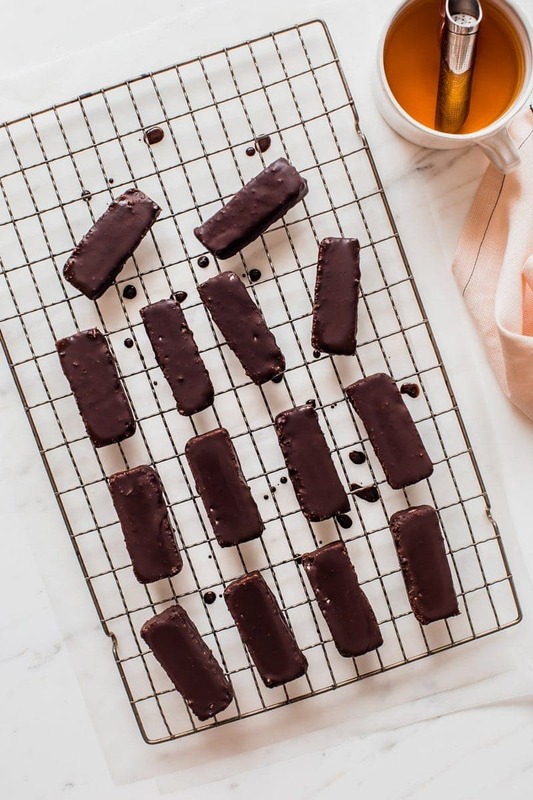 If you are a perfectionist like me, you’ll want to dunk the bars once, freeze to set, then go for a second dunking – it helps give a thick, lush coating of choc – um, yes please! And the finishing touch, a little sprinkle of freeze dried raspberry powder if you will. It is my Valentine’s treat, after all! Enjoy my loves, make and indulge! A lush coconut treat encased in raw chocolate! To make the bounty bars, combine all ingredients in a large bowl and mix till well combined. It should hold together when pressed but still feel a little on the wet side. Press into a rectangular bread tin (25.5 x 8 cm / 10 x 3 inches) lined with baking paper and use a spatula to smooth out the surface. Freeze for a couple of hours till firm. To make the chocolate, melt all ingredients over a double boiler at a low temperature and stir to combine. Ensure all ingredients are room temperature and that no water gets into your chocolate, otherwise it will seize. Transfer to a small but deep dish. Once the bounty bars have frozen, remove and slice very carefully into 14 portions. Don’t rush this process as the bars may crumble. If it is crumbling a little too much, perhaps it needs more time to set. 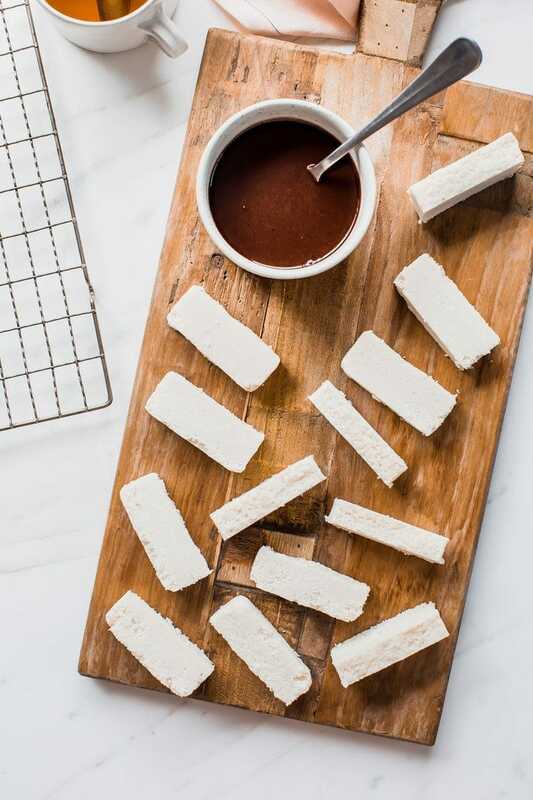 Dunk the bars in the chocolate with a fork to coat and place on a tray lined with baking paper. Freeze to set then enjoy, or go for a second coat – you’ll have enough chocolate, just be mindful it will up the sugar content (nutrition panel reflects a single coating). I used tinned coconut cream and shook it vigorously before using – combining the thick cream with the liquid portion. Don’t use the thick cream alone – you’ll get a crumbly end result. The xylitol is a natural sugar alternative than does not affect blood glucose. Opt for Birch tree derived over corn, and if you can only source the crystals, put them in the blender for a minute to powder them. By all means use less of the brown rice syrup in the chocolate coating – you can get away with half the amount, it may be a little thinner that’s all. Top with freeze dried raspberries for something a little more special.